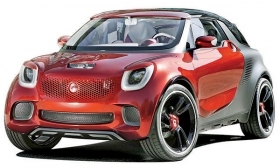 The ForStars concept may influence the next ForTwo. Until the redesigned ForTwo two-seater arrives in August 2015, Smart doesn't expect U.S. sales to grow much beyond their current level of about 10,000 units annually. The second-generation Smart ForTwo and a four-seat ForFour are being developed jointly with Renault-Nissan. Daimler CEO Dieter Zetsche said the Smart range will expand beyond those two models -- but slowly. In the past, he said, Smart added models too quickly, such as the last generation ForFour that sold poorly. The ForFour was yanked after three years on the market. Here is a summary of Smart's product plans. ForTwo: The redesigned two-seater, scheduled to arrive in August 2015, will grow by about 3 inches, to 109 inches, and will have a longer hood. Smart hinted at edgier styling with the ForStars concept at the Detroit auto show in January. The ForTwo will be powered by a new three-cylinder 0.9-liter engine co-developed by Mercedes-Benz and Renault. The engine, which replaces the Mitsubishi powerplant currently used, will be offered in both normally aspirated and turbocharged forms. ForTwo Electric Drive: The U.S. rollout of the new electric vehicle began in May. The ForTwo Electric Drive is powered by lithium ion batteries made by Deutsche Accumotive GmbH, a joint venture between Daimler and Evonik Industries. It has a range of 100 miles per charge, up from 63 miles for the previous generation ForTwo EV. The top speed increases from 60 mph to about 75. ForFour: A four-seat, rear-wheel-drive model based on the redesigned ForTwo platform could go on sale in 2016 or 2017. It probably will use the new three-cylinder engine. The previous generation ForFour was front-wheel drive and based on the Mitsubishi Colt. It was never sold in the United States. Crossover: A crossover is being considered but hasn't been approved. According to reports, Smart may use the Nissan Juke architecture.